A third of people living in England outside London live in one of England’s nine combined authorities, six being cities with directly elected mayors. Some commentators have expressed disappointment that the recent Secretary of State’s Annual Report on Devolution 2016-17 confirmed that there were no further devolution agreements in 2016-17. With combined authorities intended to be a key driver of local growth, should people, both in these regions and especially in areas without a combined authority, be clamouring for more action on devolution, or should we wait for clarity about the UK’s exit from the EU? What it will take for combined authorities to succeed in their aims? And do elected mayors have the potential to become significant figures on the national political stage? 2017 wasn’t just the year of the unexpected general election. 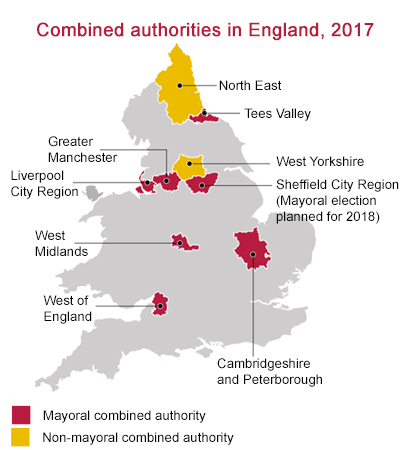 As we detailed in our report Progress in setting up combined authorities, 2017 also saw the creation of the first new type of local authorities for more than 30 years as the next step on the devolution journey. England now has nine combined authorities. For those unfamiliar with them, combined authorities are corporate bodies formed of two or more local government areas to enable decision-making across boundaries on issues that extend beyond the interests of any one individual local authority (LA), like strategic transport planning. Their primary aims are to improve local growth by working across conurbations and sub-regional areas to achieve more efficient investment and greater economies of scale in aspects such as transport networks than would be possible in individual local authority areas. They can also enable a multi-sector approach, as in Greater Manchester, with leaders think about systems rather than individual services. And they enable local flexibility over expenditure. In particular, a number of programmes were introduced between 2010 and 2015 to improve local growth and drive public service reforms. Since 2015, the key development has been the creation of the combined authorities, which put in place the structure needed to plan and deliver at scale: infrastructure, regeneration and planning. In Greater Manchester Combined Authority, they have, in addition, made great strides in public sector reform locally. Out of the nine combined authorities, six have directly elected mayors who have power, budgets and responsibilities passed to them from central government in areas such as transport, social care, housing and policing. 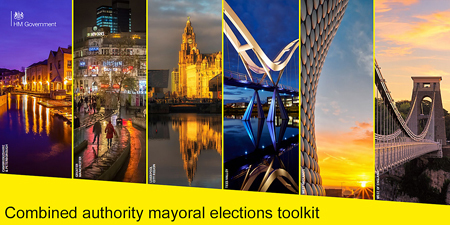 As recently as 2012, when referendums to replace local council cabinets with directly elected mayors were held in ten cities, nine electorates (including Manchester) rejected the idea. But combined authorities, rather than individual local authorities, make the role of mayor feasible. Now the six mayors of combined authorities have the opportunity to be visible and accountable to the people who elected them, and to champion their areas, attracting investment and working with local partners. The fact that the Autumn Budget gave greater funding to Mayoral areas suggests their greater negotiating powers. However, there remains a question of whether the aim of increasing democratic engagement has been, or will be, met. One of the ambitions of devolving freedoms and flexibilities is to increase democratic engagement. The mayoral electoral turnouts varied between 21% and 34%. Is 21% enough? The turnouts for the elections for London mayor and for police and crime commissioners have increased since being introduced. What turnout should mayors be aiming for? What turnover should Government consider to be the successful fulfilment of this aim? What will it take to ensure that the combine authority structures do succeed in driving local economic growth and achieving the public sector reforms needed to meet greater demands on services in the face of reduced central government funding? We asked combined authorities to identify what they considered the key factors for success in establishing and running these bodies. There are considerable challenges in achieving each of these success factors. is shared between: central government departments, various local government structures, Local Enterprise Partnerships, the Police and Crime Commissioners, Clinical Commissioning Groups, and the Homes and Communities Agency. Moreover, there are inconsistent approaches to devolution across central government departments, which risks impeding progress. This complexity comes on top of further spending reductions and declining acceptance of austerity by the public, and greater uncertainty as a result of the challenge of moving towards authorities retaining a greater share of their business rate income. This was highlighted in a round-table discussion with local authority CEOs run by the Municipal Journal and NAO, summarised in this recent MJ article The MJ/NAO round table: Fallout from the Budget. The UK’s exit from the European Union (EU) poses further challenges, as well as a distraction of time and skills from the devolution process. If the exit results in reductions in regional funding, the economic regeneration role of combined authorities would become more pressing. Combined authorities are generally in areas receiving the most EU funding: the North West, for example, is scheduled to receive in excess of €1 billion in European Regional Development Funds, European Social Fund, and Youth Employment allocations between 2014 and 2020. For combined authorities to deliver real progress and not just be another ‘curiosity of history’ like other regional structures before them, they will need to demonstrate that they can both drive economic growth and also contribute to public sector reform. DCLG (now the Ministry of Housing, Communities and Local Government) did well to get the combined authorities set up and the mayoral elections in place, but it needs to work with combined authorities on plans for assessing their impact and demonstrating the value they add. As we look ahead to 2018, it’s apparent that the UK’s exit from the EU is bound to take precedence: the Local Government Finance Bill was not in the Queen’s speech, suggesting an effective halt to further significant changes. There has not been a re-statement of policy goals for local government, and it is not yet apparent that the Fair Funding Review will be complete in 2019-20.
there must be greater focus on collecting and sharing the evidence, both to identify warning signs early and to know what approaches work, in what circumstances. As always, I welcome your comments and invite you to contact us if you would like to discuss any local government issue. 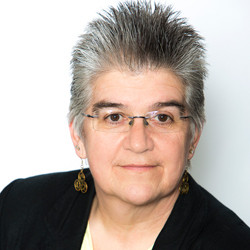 About the author: Aileen Murphie has been an NAO Director since 2002. She is responsible for our value-for-money work for the Ministry of Housing, Communities and Local Government and has led the NAO’s reports on the most important aspects of local government since 2013, including on Progress in setting up combined authorities, Devolving responsibilities to cities in England: Wave 1 City Deals, Funding and structures for local economic growth, Adult Social Care, the Impact of funding Reductions on Local Government, Planning for 100% local retention of business rates, and a number of reports on the financial sustainability of local authorities. The possible result of ever increasing devolution is to further breakdown the feeling of belonging to a nation, to increase the feeling of disconnection from the greater community, to encourage cultures to grow and exist that are not in tune with the National culture. It could possibly lead to rather small minded thinking and a feeling of fighting for the devolved community against the National community. It could return the British Isles back into an island of many different tribes. Perhaps, but the combining-authorities model(i.e. devolution) actually means communities working together more. In regards to your “Future success” section, for combining authorities, the Challenges, listed, look like a list of reasons why there should be combining of authorities in those areas. That is, if there is “tension” in a local area in regards, to say, who is responsible for signage or road maintenance, for example, then, as far as I can see, that is a reason for merging authorities. And what do you mean by “Geographic co-terminosity”? Do you mean two cities being geographically close to each other so that one can take over the other as the centre of the new combined authority without making the authority-staff have to commute too far to their new place of work? I view your list of “Challenges as a list of Opportunities and reasons for combining the authorities, in that area. A Success factor is a measure of success for the local community. That is, improved public service provision in that geographic area. You say later in this section “We asked combined authorities to identify what they considered the key factors for success in establishing and running these bodies.” Did you ask the citizens of these newly combined areas for their opinion on the definition of Success? It is the citizen, not the staff of the public services, that is the most important voice here. It is the citizen, i,e. the service user, that is best placed to answer questions about success and more importantly about failure on the part of the service providers. “Unclear objectives” sounds very like a typical excuse from the public service I have heard so often before. The objective is “utilising economies of scale” and “improving the provision of public services in a more efficient way”. If any member of staff says their objectives are unclear after reading this then I would question their ability to comprehend basic English and, in turn, their ability to do their job at all. And on further reflection I would also say it could be true that these staff(and politicians) are deliberately obstructing the successful implementation of devolution in their area. So on this basis I think one of the “Challenges” to a successful implementation of a combined authority, is obtaining the wilful co-operation of the public service staff involved. And of course these staff are there to do their duty as per the job descriptions and instructions from managers. If staff are disobeying their managers and not following their job descriptions (i.e. obstructing the implementation of combining authorities) they they should be sacked. Staff do not have the option of obstructing the work of devolution. They should not be allowed to have an option. They cannot make decisions (to obstruct) based on their personal political views on devolution. Thanks for your comments, Les. Geographic co-terminosity means the boundaries of administrative entities are the same – the Greater Manchester Combined Authority demonstrates this well. It is a benefit when aligning or coalescing services locally, and if it doesn’t exist, it tends to throw up more challenges. On your question ‘Did you ask the citizens of these newly combined areas for their opinion on the definition of success?’, no we didn’t consult the local populations. I do agree, ’though, that democratic engagement is really important for the new combined authorities, which is why the new mayors are very important. I thought government organisations were supposed to be moving away from business jargon, not resurrecting decade old management speak? !